“Everyone is different”, she said. “I was born this way for a reason.” She explained that she used to compare herself to others, thinking ‘how can I be like that?’ instead of ‘how can I be the best version of myself?’ She accepts her strengths and weaknesses alike, and recognizes that her life trajectory will look different from the next person’s because, well, she is her own person. We all are. Her name is Aisha and I had the pleasure of chatting with her this morning over coffee. She ordered a decaf espresso (who drinks decaf espressos?! I guess everyone is different, right?). She said she likes the bitter taste. I met Aisha through my 37th stranger, Mandy. When I had told Mandy about how I love to write and freelance occasionally, she said that I just had to meet Aisha. I’m glad that I did. Aisha has the loveliest British accent. Coupled with a great sense of humour (think: a cross-section between sarcastic and silly), she definitely kept me on my toes. Aisha’s work schedule is a little bit unorthodox. She goes into work for three days a week, where she manages the mentorship database for small businesses in British Columbia. On Mondays and Fridays she works from home, freelancing, building her website, and networking. She knows herself well, explaining that she enjoys independent work and being in control of her job. What she’s doing right now gives her the perfect mix. 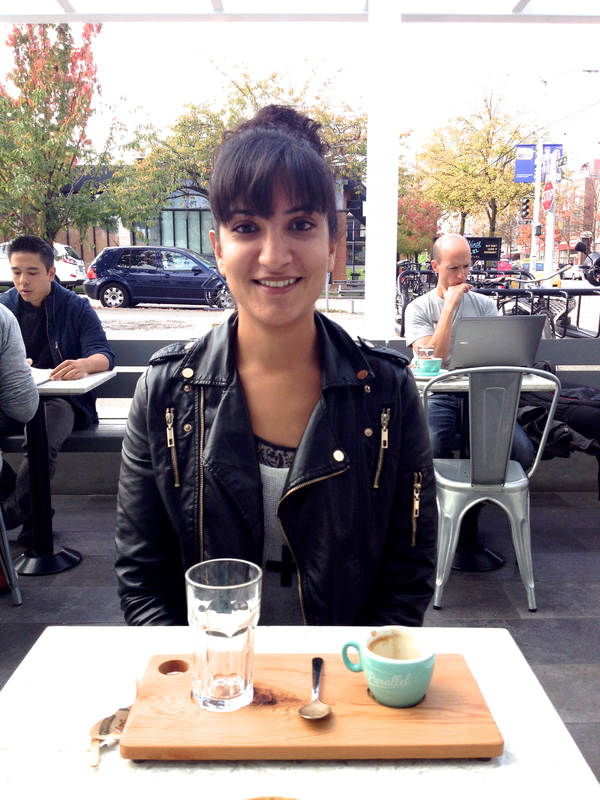 Aisha studied marketing at UBC’s Sauder School of Business. She was interested in business but was never really into the numbers side of things. She enjoyed communications and working with others. And so marketing fit the bill. She kept reiterating that she got to where she is today partly by coincidence but mainly by working many jobs that weren’t right for her. Through trying out many different jobs she was able to learn what it is that really draws her in. When Aisha’s not writing or working, she likes to exercise. But she gets bored easily. So, she likes to change it up every now and then. She likes cross fit, fitness circuits, yoga, and, once she builds up her upper arm strength, she thinks she’ll try parkour. She also loves spending time with her dog Max, who, she noted, is British too. Apparently, he barks in a high pitch and kind of sounds like a human. Training him taught her some important lessons on how to be patient. Every morning, Aisha spends 10 minutes writing in her journal — just getting her thoughts down on a page. She finds that it clears her head. She described to me how there’s just something very clarifying about getting all of the thoughts that are floating around to sit still on a page, especially at the beginning of the day. It’s a technique she learned from The Artist’s Way. Aisha believes that it’s important to know what grounds you — what can help you clear your mind when there’s a lot going on? For her, it’s meditation, exercise, and playing with Max.